To make your implant process succeed, your dentist will have to take time to make sure every step along the way is done correctly. That means you’ll need a thorough consultation and some testing to make sure you’re a good candidate, and then you’ll have to undergo surgery so your dentist can place the implants. Understandably, there are significant costs associated with the procedure. Once you’re ready to get your new teeth attached to the implants, your dentist will install custom-made crowns. Designing your new chompers takes time and money because everyone’s mouth is different; it’s not like companies can mass produce the crowns and sell them in bulk. If a crown doesn’t fit right, it could cause damage to adjacent teeth and throw off your bite. They can last a lifetime. 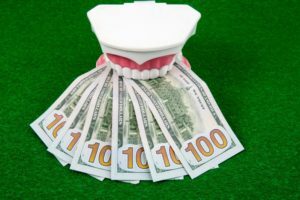 Other types of tooth restorations may need to be replaced every few years, which means that you’ll always have to have room in your budget for your next set of dentures or your next bridge. They prevent bone loss. When you lose teeth, your jaw eventually changes shape and becomes weaker. However, dental implants bond with your body and can keep your bone strong. How much are your bones worth to you? They protect your natural teeth. If you don’t take steps to replace your missing teeth, the ones that still remain in your mouth may drift out of place. Implants stop this issue, meaning that they can prevent the need for future tooth extractions or expensive dental procedures. They allow you to enjoy a variety of food. Without a balanced diet, you may find yourself facing painful (and expensive) health problems. Implants give you a strong bite so you can enjoy all the wholesome goodies that will keep your body strong and your medical costs low. Your implant dentist in 24501 understands that you’re on a budget. But when you understand the value of dental implants, can you really afford not to consider them as an option for replacing your missing teeth? Dr. James M. Peery Jr. and the rest of the team at Peery Family Dentistry are devoted to helping their patients enjoy great oral health. If you have questions about dental implants (and how to pay for them), please contact us at 434-847-5331.